After weeks of speculation surrounding Dell's rumored MacBook Air competitor, the PC maker finally gave a sneak peek to journalists of its new Adamo portable at the Consumer Electronics Show in Las Vegas. But much toÂ*the dismay of those attending, it was hard to get a clear look at the machine. A model carried the notebook around in front of the room in only one hand but in low light, then she was whisked away from the stage. According toÂ*Engadget, all they could get out of Dell execs was that "Alienware is [Dell's] top performance brand, Adamo is our top design brand." Dell consumer sales and marketing vice president Michael Tatelman said the Adamo will represent Dell's "luxury franchise", and to expect a release in the first half of this year. Â*Tatelman declined to reveal any information about price, saying development is on schedule and this was only a "sneak peek". 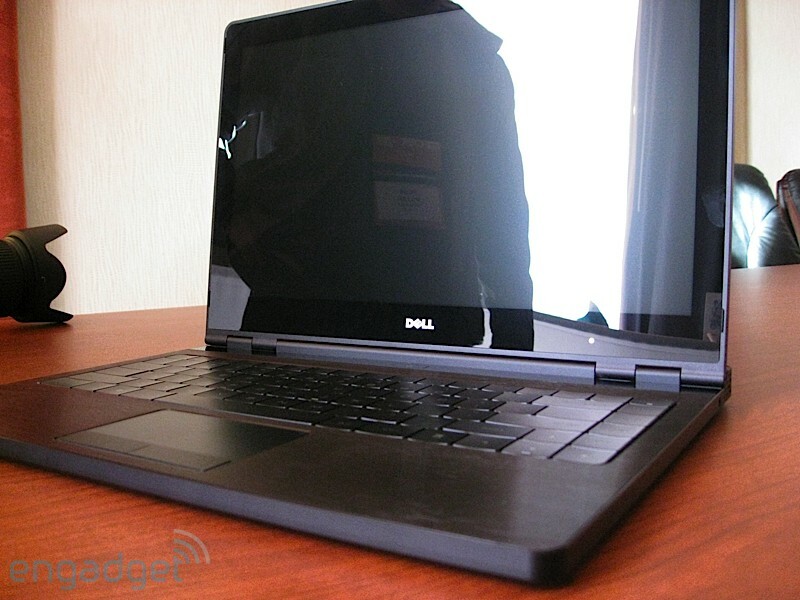 as the "world's thinnest notebook"
....."as the "world's thinnest notebook"......in The "Dell World of Laptops"
From the engadget photo's it looks closer to the 2006 Black MacBook than the 2008 MacBook Air. The Air is difficult engineering and it has a high price because of it. No matte screen for you. I don't think this beats the MBA by any stretch of the imagination, but still I can't help but wonder how they are going to use that tagline. Even if they say it's the World's thinnest "PC" or "Windows" laptop, just fire up BootCamp on the Air and there go those claims as well. Plus, would it really count anyway if you try to make your portables thinner by making the footprint larger (don't forget the battery hanging off the back)?! It will be packed full of smudge! I think it looks OK except for the hinge and the part sticking out behind the display. I think the black border around the screen need to be reduced. However, they need to spend more on the design to call it luxury laptop. Maybe they should stop trying to copy Apple designs and come up with something original instead. But much to*the dismay of those attending, it was hard to get a clear look at the machine. A model carried the notebook around in front of the room in only one hand but in low light, then she was whisked away from the stage. That model is kinda scary. So is the laptop. That ledge on the back is weird. This years Dell ultra-thin notebook book is last years (well two years ago?) Apple's black MacBook! Well, if they succeeded in making it just a tad thinner than the air at it's thickest point, then can validate their claim. nonetheless the constant thickness will make it feel thicker anyway. I remember a time when some Apple fans ragged on Windows notebooks that had the wedge shape. Now that Apple does it, it's a feature. I think it's kind of nifty, though I think the hinge should be at the back edge, not forward a bit. but can it cut cake? i don't think so. michael dell, you fail! Not in the same class as the Air, but not bad. I think Air is more like costly construction than difficult engineering. The engineering behind making a billet frame isn't that terribly difficult, it just consumes more material and more machine time than other case manufacturing processes. That seems to be offset by having a bezel that's not as wide. The air's screen bezel is pretty wide. We'll see for sure when the device specs are published if the footprint is really pushed out or not. 1. It looks most like an old ThinkPad to me. Blocky and black. It doesn't look like it was "designed" at all, just packed into a rectangular case. 2. Am I the only one who has a histomine reaction to phrases like "luxury franchise" when trying to compete against Apple? I don't consider Apple a luxury buy-- I think it's worth the money and is a reasonable return on investment. If Dell is trying to sell to "luxury" buyers they aren't really in the same market as Apple, IMHO. Not that great. It seems pretty plain, and really, as discussed, its not that unique. That being said, while some people might think it looks good, its only because it hasn't been turned on. You hit the power and see a Vista start screen - then it becomes a truly ugly POS. Last night I bashed windows music (new) program - but after reviewing some of windows 7 (downloading now), microsoft has quite a bit of advantage with the CLOUD experience, TV and computing, Touch phones, super high end table touch pc's that get all the info from the device simply by placing it on the screen, the task bar does great things in WINDOWS 7 as far as orginzation, and a lot more. Epsecially for productivity and their partners are coming out of the woodwork. In retrospect, Apple can't get PUSH right and doesn't have FLASH/Copy Paste for iPhone and their cloud (ME) seems way behind compared to what MS is doing, and you can't compare things like Apple TV to what the end user will be able to do with PC's - Windows 7 will be a bust of a huge hit. I could be wrong but it may look like Apple is the one playing catch up. Well the guys from Engadget that took the snaps and have seen it closer than anyone so far said it looked "less than an inch thick." The Macbook Air is barely a hair over 3/4 of an inch thick (0.76"). The thinnest laptop ever was 0.72" (but it was a flop for other reasons). I'd be surprised if this is thinner than an Air. It certainly doesn't look like it. If it is, we are talking perhaps a tenth of an inch or maybe even millimetres. Why doesn't someone break the ice and introduce a multi touch LCD for a keyboard? Both Windows and OS X are capable of handling such input.